Headquartered in Mount Laurel, New Jersey, AnnieMac Home Mortgage, a d/b/a of American Neighborhood Mortgage Acceptance Company, LLC has provided quality mortgage loan products to consumers nationwide. As a direct lender, AnnieMac Home Mortgage has access to the all of the best mortgage programs offered, such as home mortgages, jumbo mortgages, and refinance mortgages. Since all of our processing and underwriting completed in-house, consumers can not only expect a quick and efficient process but exceptional customer service positioning us as a leader in the mortgage lending industry. AnnieMac Home Mortgage is proud to be recognized as an accredited business by the Better Business Bureau. We strive to provide you with the highest-level of expertise and customer service. Our Licensed Mortgage Loan Originators will make certain that your experience is as straightforward and comfortable as possible. We pride ourselves in being able to provide you with personalized loan options that work best with your individual situation. And, that’s just the beginning of our service. With over 50 years of experience, our staff strives to offer you prompt, responsive and professional service. Throughout the entire loan process your Licensed Mortgage Loan Originator will provide you with regular loan updates and progress reports so you are aware of your loan status each and every step of the way. 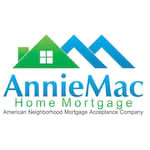 At AnnieMac Home Mortgage, we go that extra mile to build strong relationships with our customers by offering unique benefits that other companies are reluctant or unable to offer. We are dedicated to delivering you with the services designed to improve your financial security and future…it is this dedication that our foundation was built upon. American Neighborhood Mortgage Acceptance Company LLC doing business as AnnieMac Home Mortgage, Frontgate Mortgage Company and The Mortgage Company is a privately owned retail mortgage lender and broker. American Neighborhood Mortgage Acceptance Company LLC has been issued the NMLS number 338923 and is not affiliated with or endorsed by any state or federal government entities or any entities sponsored by the same.